I have an application where I need as large a physical aperture as possible. By physical, I mean actual aperture in mm, not as an f-number. I also need this lens to focus to about 0.5m. I have the 85mm Nikkor f/1.4, which has a diameter of about 60mm, but doesn't focus close enough for me. Sigma have a 180mm f/2.8 macro which should be about 64mm diameter. Is there anything commercially available that is larger? Since people in the comments have requested why I'd like to have a large diameter, I have added this diagram to explain what I am trying to do. My goal is to maximize the angle, theta, which represents the proportion of scattered light that reaches my lens. For a fixed focal distance, that means maximizing the diameter of my lens. The 180mm F/2.8 EX DG OS HSM APO Macro has in fact the largest diameter among lenses which focus at 50cm or less. 64mm as you suggested. This search was done internally on my database at Neocamera which includes all consumer lenses currently available, so over 1200 lenses. 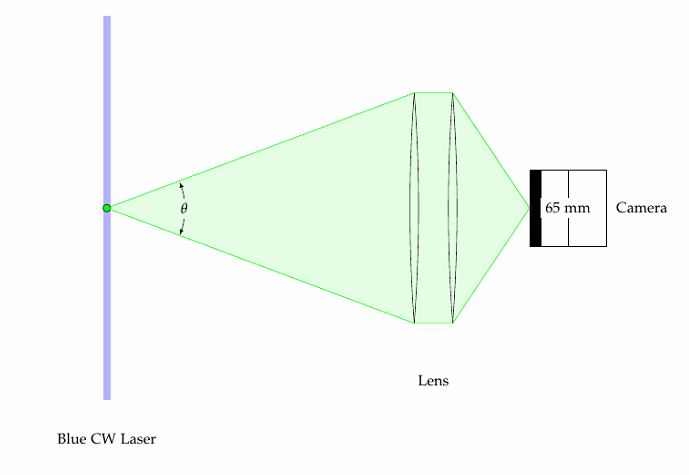 To find other options you may have to look at lenses for large format film cameras. Your 85mm f1.4 can work in this close if you mount a close-up lens. These are also called close-up filter. They come in different powers. I think you should try a +3. You can test, go to the drugstore and buy a +3 reading eye glasses. Hold it before your lens to test. If this works, purchase a +3 achromatic. These actually work quite well but some will phoo-phoo. You can also add an extension ring. Please inform as to why you need a large working diameter lens. You're looking at third party lenses: this database of Nikkor lenses shows that the largest aperture you'll get with close focus of 0.5m is with an Ai or Ai-S 58/1.2 Noct, for an aperture of about 48mm; or an AF 200/4 D Micro for an aperture of 50mm. I suggest an extension ring. Closeup lenses in large diameters tend to be prohibitely expensive. An extension tube will rob you of some light, but this need not be a problem with your application. In fact your application could have a problem with chromatic aberration common with closeup lenses. You can purchase inexpensive set of Chinese extension rings on the well known auction site, and stack them as required. This will allow you to work with your 85/1.4 Nikon lens (if close focusing was the only issue you had with it). Not the answer you're looking for? Browse other questions tagged lens macro macro-lenses or ask your own question. What is the largest aperture on a commercially available lens?